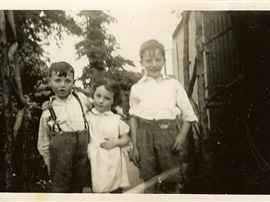 Brothers Donal and Desmond Lysaght on a visit to their brother William (Nay) Lysaght's hut, Corbally, August 1950. This section of Gabbett's Grove was known as the huts. 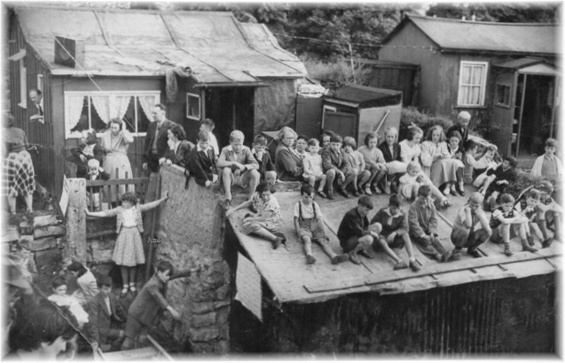 In the late 40's and 50's when people hadn't much, we were privileged to have a hut on the banks of the Shannon at the end of the Mill road, we spent our Summers there. In this magical place we grew to love water and all its aspects. We woke each morning to a special beauty, always changing, always new and filled with the wonderful element of nature. Our days were spent swimming, boating, fishing, picking blackberries, hopping in and out of boats, rowing or paddling over to St. Thomas's Island to swim from the lovely sandy beaches at the tip of the Island, sometimes to explore the ruins of the old house or search for mushrooms. Every evening at dusk, we saw a great spectacle take place in the sky, when the rooks, jackdaws and ravens, all caw cawing loudly, gathered in a whirling mass, preparing to settle down for the night in the tall trees in Ruddock's and Forde's. 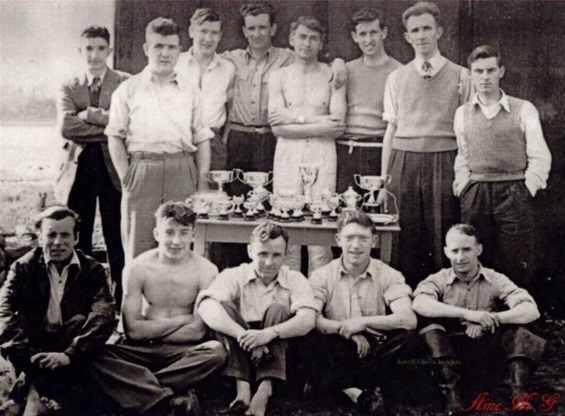 HUT OWNERS, FRIENDS AND ORGANISING COMMITTEE OF CORBALLY REGATTA 1952. Back row: L to R, Kevin O'Reilly, Mike Buggy, Bob Kinsella, Larry Kinsella, Johnny Delahunty, Seanie Gilligan, Joe Gilligan, Pat Hogan. Front row: Tony Darcy, Dom Sheehan, Nay Lysaaght, Sean Real, Donal Lysaght. 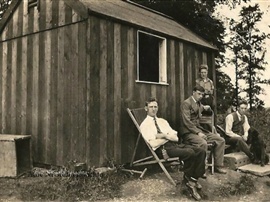 The hut owners were mostly from St. Mary's Parish except for Larry Kinsella who was from Wexford. In hut No. 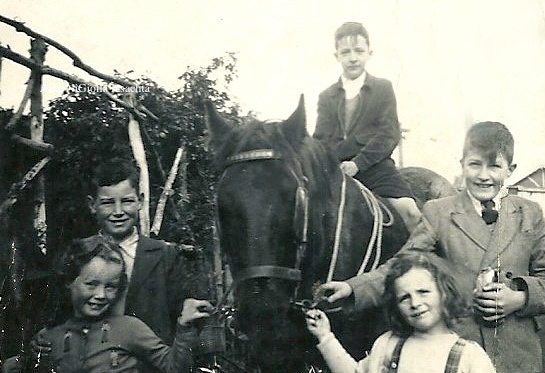 1 was William (Nay) Lysaght, next was his uncle Arthur Lysaght, Peter Fagan, Densie Cowhey, Gus Hanley, Mickey Collins, Larry Kinsella, Joe O'Shaughnessy, Seanie Gilligan/later Jack Meehan and Johnny Delahunty, Johnny Hogan had a hut on the opposite side of the Grove overlooking the Mill Stream. The huts were very basic, small, well built wooden structures, warm and cosy inside and consisted mainly of a bedroom, living room, tiny kitchen, outside toilet, small front garden, the river was an extension. 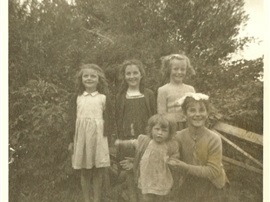 In Kinsella's garden July 1950. Sitting in background Larry Kinsella, From left: Ann and Pat Lysaght and Susan Kinsella. So fond were Larry Kinsella's memories of this little spot, when he died in England 1989, his family brought his ashes back to be scattered in the place he loved so well. On 2nd August 2008 the ashes of Chrissy Hogan who died in England in June, were brought home by her family and scattered on the river from the pier at Pat and Marie Lysaght's house at the end of the Mill Road. 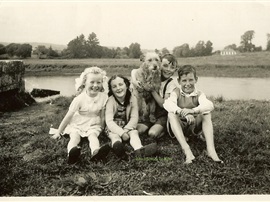 Elaine Hanley, Ann and Pat Lysaght with dog Ginger and Michael Hanley, August 1952, sitting near the block house on the Green, Liberty Rock and St. Thomas's Island in the background. 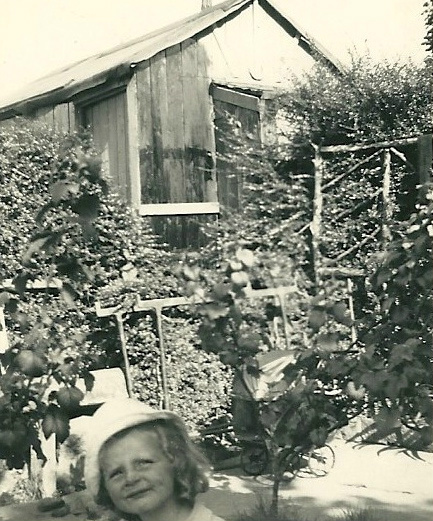 In Kinsella's garden, July 1950. Pat and Ann Lysaght and Terry Kinsella. This is one of the first huts in Corbally, built by Martin O'Farrell. 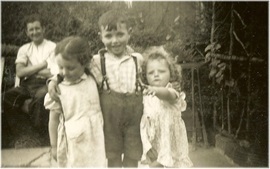 In the photo: Martin O'Farrell, Jim Gilligan, Connie Crowe, the boy standing is Charlie Walnutt who lived nearby in "Willow Bank Cottage" now "Corbally Cottage". Arthur MacLysaght 1887-1971. 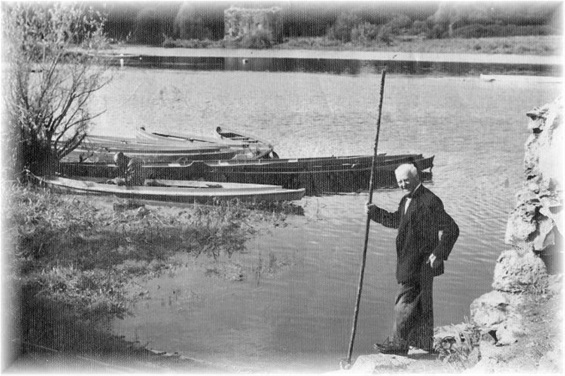 A keen fisherman and river enthusiast with his fleet of boats for hire, Corbally 1960. In his younger days, he was an outstanding handballer and played many great games in the Old Ball Court in Watchouse Lane with J.J. Bowles and Ned Bourke. Man sitting in boat is Peter Fagan. 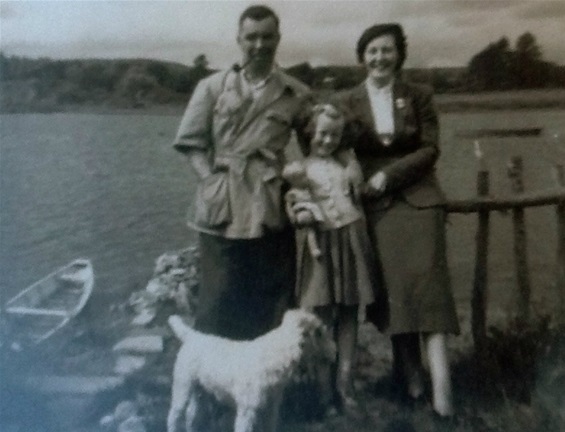 Mr. & Mrs. Gus Hanley caretakers of Corbally Baths in the early 1950's with daughter Elaine and dog Snowey, photo taken in the garden of their hut at end of Mill Road. (Photo courtesy of Michael Hanley, Bristol, England). Mr. Gus Hanley with son Michael and daughter Elaine posing for a photo before taking off for a spin around St. Thomas's Island in their angling cot. Michael and Elaine Hanley messing about in the river in front of their hut. 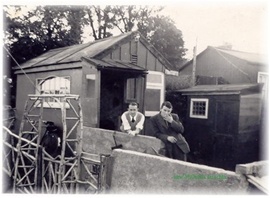 THE BOATHOUSE AT LYSAGHT'S HUT BEING USED AS VANTAGE POINT DURING CORBALLY REGATTA 1953. 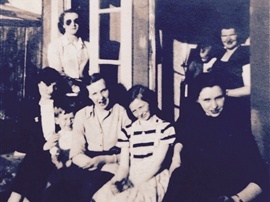 Spectators from Left: Mrs. Rosaleen Lysaght, Joan Eakins, Davie and Sarah Keane, Paddy Kinsella, Mrs. Frahill, Mrs. Hannah MacLysaght, Hannie Reid, Maurice McMahon, Johnny Reddan, Paddy Moloney, Joe Dennihy, Mary Sheehan, Terry Gilligan, Myra Sheehan, Monica Byrnes, Joe Sheehan, Helen Gilligan, Connie Kerley, Pat Lysaght, Tim Dennihy. Corbally Boat Club taking part in the An Tostal Parade in Limerick 1953. 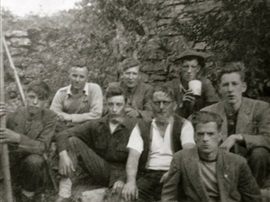 From left: Ger Gilligan, Denis O'Shaughnessy, Bob Kinsella, Larry Kinsella, Kevin O'Reilly, William Lysaght, Larry Devaney, Martin Hogan. 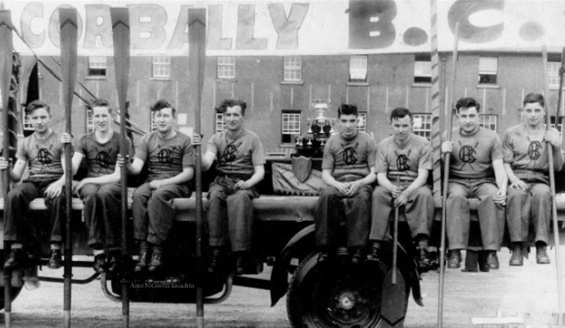 Back Row: Nay Lysaght, Bob Kinsella, Mickey (Smokey Joe) Collins. Center: Martin Hogan, Dom Sheehan, Johnny Hogan, Denis O'Shaughnessy. Front: Bobby Nolan. (Photo courtesy of Mary Gilligan, Chicago, U.S.A.
From left: Susan Kinsella, Ann Lysaght, Elaine Hanley. Front: Doreen and Joan Hogan. Donal Lysaght is my Godfather. Helen Gilligan Holz. Is there a book available to purchase, please let me know. Thanks. No book available Helen, just the website. Interesting to hear Donal was your Godfather, Donal and my father were brothers and great friends of the Gilligans. Thanks for giving me the opportunity to share some of the history of my family with my mother, Mary Glynn Gilligan. She enjoyed seeing the photos . Glad to hear Helen that you and your Mum enjoyed the photos, I presume you are that little baby Helen in one of the photos above. Regards to all in in the U.S. The Gilligan's Patrick were so much part of our lives in those wonderful years,it was indeed a magical, carefree & unforgettable time.Regards to all in the U.S. Wonderful to hear from you Mike. Hope you liked the photos of old friends. Great you put a name on J. Delahunty"s place. I have a question I want to ask you. Knew your Mum well Fiona, remember the occasion of her home being burnt to the ground, also the scattering of her ashes at end of Mill Rd. See mention above. Great page! My parents house in Corbally burnt down in 1965. My Mum Chrissie Carmody (nee Hogan) loved the huts. I brought her ashes back here in 2008.